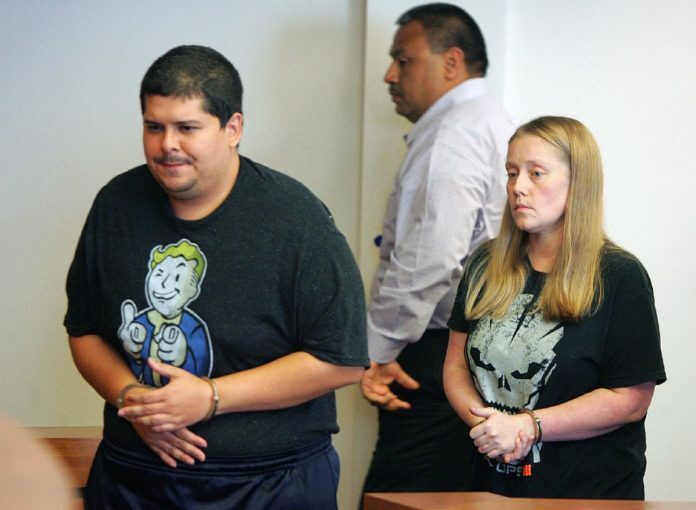 Jillian Rae Hanson, 27, right, and Fabian Paredes, 31, enter the courtroom before being arraigned for the murder of Joshua David Sanchez in Edinburg Municipal Court on Oct. 13, 2017 in Edinburg. EDINBURG — Police believe road rage led a man and his common-law wife to participate in the shooting death of a 26-year-old man earlier this week. An Edinburg municipal judge charged Jillian Rae Hanson, 27, and Fabian Paredes, 31, with the murder of Joshua David Sanchez on Friday afternoon. Investigators believe Paredes was behind the wheel of a red Ford F-150 when he shot and killed Sanchez, who was driving a white passenger vehicle. Both parties had been arguing before the shooting broke out near the Hidalgo County Courthouse on Monday afternoon, Edinburg Police Chief David White said. Investigators believe Paredes used a 9mm handgun to shoot Sanchez before fleeing the scene. A judge charged his wife with murder under the law of parties because Hanson was in the vehicle and did not come forward after the shooting. Instead investigators pieced together bits of evidence and were able to locate the vehicle and the home where the suspects lived, White said. Police watched the home until they located the suspects. Investigators arrested the couple Wednesday afternoon and they confessed shortly after, White said. Paredes and Hanson looked visibly upset at their arraignment, where they were issued a $500,000 bond, coupled with electronic monitoring. Vanessa Gonzalez, Sanchez’s cousin who attended the arraignment, said Sanchez had just left work at Whataburger when the shooting occurred. Her cousin, though always smiling, was prone to road rage, she said. The 26-year-old single father leaves behind two children under the age of 7, who will now be relocated to live with their mother. If convicted of the first-degree felony, the couple could face between 5 and 99 years in prison and up to a $20,000 fine.